Throughout my movie viewing life, from time to time I have wanted to have seen some of the ‘greats’ of cinema. Movies that continue to be talked about, influential and be regarded as masterpieces, those titles any self-respecting movie fanatic should say they’ve seen. So I began trawling the celebrated IMDB Top 250 for movies and found there were many I didn’t recall having seen either partially or at all, much to my embarrassment. Now let’s go back a few years to when I watched a movie called Glengarry Glen Ross, a movie that at the time was highly acclaimed and said to be a spiritual successor to this 1957 classic. So I’d always wondered if I’d like that movie’s supposed inspiration as I had Glen Ross itself. This tells the story of a jury who need to make a decision regarding the case of an eighteen year old guy who is accused of murdering his father. Their decision would mean the difference between this lad walked free, or facing the electric chair. Twelve men, all strangers to one another adjourn into a single room to discuss their verdicts and that is where the majority of the movie plays out. With the backdrop of a very hot summer’s day and the claustrophobia of the room, soon tensions are burning as these very different men spar it out and way up facts verses their own beliefs and the testimonies of witnesses. It proved thoroughly gripping, surprisingly so and with a cast of occasionally familiar looking actors (was that Quincy?) headed by the late Henry Fonda … I enjoyed watching it all play out. At times some of the acting is a bit on the theatrical side, and it kind of ends abruptly … but for it’s time this must have been ground-breaking, free of much of the trappings of typical Hollywood fair. It made me feel like I was weighing up the facts and trying to come to a decision as much as these men were. I certainly get why this movie has endured and still gets talked about as it tackles a relevant subject, with the death penalty still around in certain American states. Also Sidney Lumet’s direction is like a study of human preconceptions and prejudices, bringing out subtle nuances of every character. I was left suitably impressed. 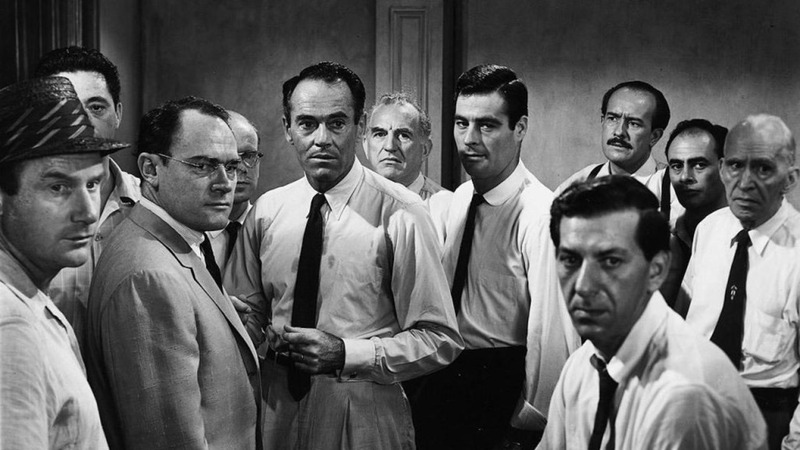 This entry was posted in Drama Reviews, Hollywood, Movies, Reviews and tagged 12 Angry Men, Black & White, classic, Henry Fonda, Hollywood, IMDB Top 250, Sidney Lumet by Craig M. Bookmark the permalink. Nice review -sufficiently compelling that I will likely watch this. Thanks for postinb.